Bryce Harper got 12 plate appearances in a simulated game against minor-league pitchers Thursday at the Carpenter Complex. CLEARWATER, Fla. -- Game on, Bryce Harper. After getting a dozen plate appearances against four minor-league pitchers on a back field Thursday at the Carpenter Complex — and hitting another home run in the process — the Phillies’ new superstar was cleared for game action. 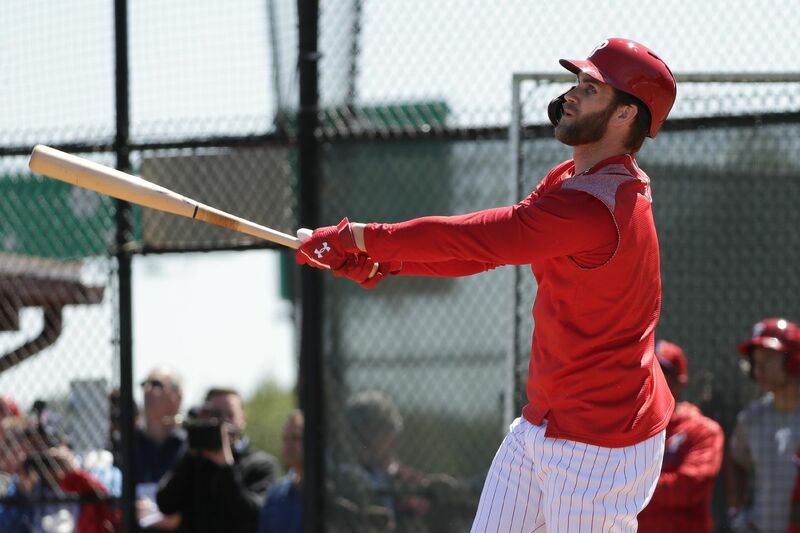 Harper will get a break from live at-bats Friday and will be the designated hitter Saturday against the Blue Jays in Clearwater and get one or two at-bats, according to manager Gabe Kapler. The Phillies have 18 spring-training games left before opening the season at home March 28 against the Braves. Harper has averaged 50 spring-training at-bats per season since 2013. If he plays in, say, 10 Grapefruit League games, he could conservatively get 30-40 at-bats. One week after agreeing terms on his record-setting 13-year, $330 million contract, Harper took part in his second simulated game in as many days. He hit an opposite-field homer in his first at-bat against single A right-hander Gustavo Armas and put the ball in play six times, breaking his bat once. Scott Kingery made his first start of the spring in center field in the Phillies’ 6-0 split-squad loss to the Yankees at Spectrum Field, a notable detail considering both Odubel Herrera (hamstring, flu) and Roman Quinn (oblique) have been sidelined. At this point, Kapler said the Phillies are “not concerned” about Herrera starting the season on the disabled list. He characterized Quinn as “ahead of his original schedule,” but also said the Phillies remain in wait-and-see mode on whether he will be ready for the opener. If neither Herrera nor Quinn are ready, Kingery figures to be an option to start in center field. The utilityman also will get at-bats at third base, although Maikel Franco likely has the inside track on the everyday job. Another center-field alternative: Aaron Altherr, who can’t be sent to the minors without clearing waivers. Dylan Cozens, a corner outfielder who is having a strong spring, got a start in center field earlier in the week. In the other half of the split-squad game, pitching prospects JoJo Romero, Adonis Medina and Cole Irvin combined to allow one unearned run in seven innings of a 3-1 victory over the Tigers in Lakeland. … Right-hander Drew Anderson continued to make a positive impression. Using a recently developed cutter to replace his slider, he gave up one hit and struck out six batters in three scoreless innings against the Yankees. … Second baseman Cesar Hernandez (hip flexor) took batting practice and is closing in on a return. … Right-hander Zach Eflin will start Friday night against the Braves in Lake Buena Vista, Fla.